Google acquired Motorola Mobility for $12.5 billion in hopes of being able to leverage its patents against Apple, Microsoft and others on whose intellectual property Android demonstrably infringes to a massive degree. But when Google bought Motorola, it also assumed obligations, one of which is to honor the FRAND licensing pledges it made to standard-setting organizations and, by extension, third parties relying on them. Motorola's FRAND promises are going to be at issue in two contract law trials next month. On November 5 (in a week from tomorrow), Apple's contract claims will go to trial in the Western District of Wisconsin, and eight days later, a Microsoft FRAND enforcement lawsuit from November 2010 will get its day in court in the Western District of Washington. The wholly-owned Google subsidiary is struggling with this situation in two different ways, a logistical and a substantive one. The logistical one is that the two trials may very well overlap, but some witnesses are needed in both federal districts. The substantive part is certainly the more pressing problem: apart from appeals, Motorola's assertions of standard-essential patents (SEPs) against Apple and Microsoft could come to an end in a matter of weeks. Theoretically, Google's Motorola could still try different procedural maneuvers, but its chances of actually achieving something -- and of avoiding backlash from the courts adjudging the FRAND cases -- could be very, very slim, depending on the clarity provided by the courts in Seattle, WA and Madison, WI. Motorola particularly doesn't want the courts to take measures that would result in SEP license agreements. On Tuesday (October 23, 2012), Motorola made an attempt to conflate procedural and substantive issues. It filed a "motion for guidance on trial schedule" in Wisconsin that was formally limited to the question of whether the Apple trial would be concluded before the Microsoft trial begins. Most of the text of the motion, however, addressed the scope of the trial, which is Motorola's primary concern. In the Microsoft case, Motorola brought an entire motion only to narrow the scope of the trial, and didn't gain any ground because Judge James Robart, while formally agreeing with Motorola that a breach-of-contract issue would be the subject of a subsequent jury trial, reaffirmed his game plan. He wants a true solution while Google's Motorola would rather keep the door open to even more problems. Further below I'll talk about how Microsoft and Motorola summarized their positions ahead of their trial. But let's stay in Wisconsin for a couple more paragraphs. Motorola's motion for guidance on the trial schedule was, for the most part, a disguised summary judgment motion seeking to avoid in Wisconsin what Motorola couldn't avoid in Washington State: a FRAND rate-setting decision by a court of law. Motorola would be fine with this in Germany, where it recently felt forced to accept a licensing proposal from Apple and where the parties will meet in court, presumably next year, over the determination of a FRAND rate. But Motorola doesn't want this to happen in the United States, and especially not in a way that takes care of the FRAND licensing question on a worldwide basis. "Motorola has filed a request for guidance, directed to the scheduling of the trial set to begin on November 5, 2012 (dkt. .) At present, the trial is expected to run for two weeks. The court will make every effort to keep the trial to one week but can make no promises that it will not last longer. Motorola will have to work within this schedule and plan its witnesses' testimony accordingly. Signed by District Judge Barbara B. Crabb on 10/26/12." This doesn't mean that the court will necessarily grant Apple's wish and engage in FRAND rate-setting. But it appears that the judge doesn't want to rule this possibility out, or commit to anything, at this stage. 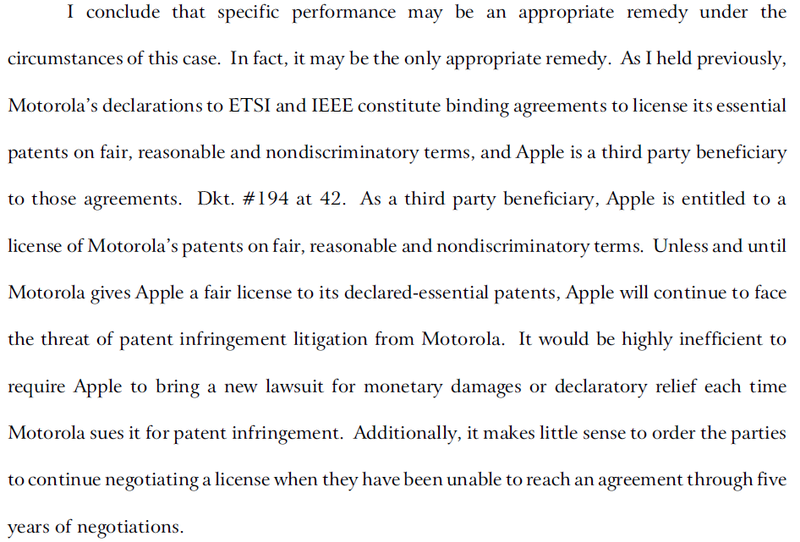 Motorola had argued in its motion that the trial could be concluded within one week unless it becomes a rate-setting trial and expressed concern about the fact that "[i]n its recent motion in limine oppositions, Apple intimated that it will request the Court to impose a royalty rate for the entire ETSI and IEEE global portfolios owned by Motorola". Yes, "global portfolios". If this worked out, the German FRAND rate-setting exercise might just be rendered unnecessary. In both cases (Wisconsin and Washington State) Motorola has already lost on some key contract law issues at the summary judgment stage, but it's still defending its position that its initial royalty demand of 2.25% (of the price of the relevant end product) did not constitute a breach of contract. And it disputes the courts' jurisdiction to determine FRAND rates. But it's limited in its ability to make its case, particularly in the dispute with Microsoft because of its October 2010 demand letters. Motorola is now trying to thread the needle and identify licensing terms that its demand letters did not specify (at least not in detail). This way, Motorola hopes to kill two birds with one stone, seeking to complicate things for the courts that are trying to bring about a solution (by telling the judges that setting a FRAND royalty rate is insufficient) and additionally trying to read some more reasonableness into its original demands than the October 2010 letters to Microsoft reflected. Those original demand letters did make reference to a "grant back license" to Microsoft's patents essential to the same standards. 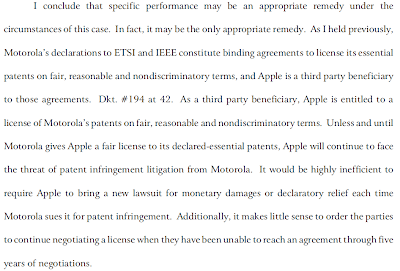 And in the motion for guidance in the Apple case in Wisconsin, Motorola also argues that "the contracts at issue require reciprocal cross-licensing of essential patents". I don't agree with Motorola that the courts need to set the terms for an SEP cross-license. As long as Apple or Microsoft don't seek injunctive relief based on their SEPs (which I'm sure they won't because they've made unequivocal statements in litigation and in public), there's no reason why the grant-back licensing terms couldn't be set later. Also, as far as Microsoft's H.264-essential patents are concerned, Motorola could easily license them under the terms of the MPEG LA AVC/H.264 pool, anytime -- as its corporate parent, Google, already has. At any rate, Motorola uses the terms of a grant-back license as an argument in the Microsoft case for the claim that its original royalty demand (which corresponded to a $4 billion annual royalty figure) was FRAND (fair, reasonable and non-discriminatory). I'll now quote three paragraphs from Motorola's position stated in the proposed pretrial order for the Microsoft case and will comment below each quoted paragraph. Motorola references some of its Proposed Findings of Fact -- the relevant passages were redacted in that document, but the tentative pretrial order sheds light on what they say (even though it doesn't state all the numbers). "1. The [F]RAND royalty for a license to Motorola's H.264 SEPs is 2.25% of the net selling price ('NSP') of licensed products (e.g., Microsoft's Xbox 360 or Windows OS software), based on a hypothetical negotiation between the parties considering the relevant evidence (e.g., Motorola's past licenses, the strength and value of Motorola's patents, and the use of Motorola's patents by Microsoft). Based on that same evidence, an appropriate cap should apply to any net royalties payable to Motorola. The royalty due to Motorola would be offset by a [F]RAND royalty for a license to Microsoft's H.264 SEPs which also is 2.25% of the NSP of licensed products (e.g., Motorola's smartphones and set-top boxes), based on a hypothetical negotiation between the parties considering the relevant evidence (e.g., the relative strength and value of Microsoft's patents and the use of Microsoft's patents by Microsoft)." The royalty base stated above is grossly inconsistent with Motorola's October 2010 demand letters, which explicitly ruled out that the royalty would be a percentage of Windows revenues, stressing that the total price of the relevant end product, such as a laptop computer running Windows, would be the royalty base. Motorola has backtracked in this regard -- and we're not talking about a subtlety but about billions of dollars per year. After the November 13 FRAND rate-setting trial, the breach of contract issue will be decided based on whether Motorola's initial royalty demand was "blatantly unreasonable". If Motorola now argues that Windows sales -- not PC sales -- are the appropriate royalty base, the difference between what it wanted then and what it claims now is probably more than what's needed to conclude that the original demand was blatantly unreasonable and, as a result, constituted a breach of a FRAND contract. "2. The [F]RAND royalty for a license to Motorola's 802.11 SEPs is 2.25% of the NSP of licensed products (e.g., Microsoft's Xbox 360) based on a hypothetical negotiation between the parties considering the relevant evidence (e.g., Motorola's past licenses, the strength and value of Motorola’s patents, and the use of Motorola’s patents by Microsoft). The royalty due to Motorola would be offset by a [F]RAND royalty for a license to Microsoft's 802.11 SEPs which is 0.25% to 0.5% of the NSP of licensed products (e.g., Motorola smartphones and tablets), based on a hypothetical negotiation between the parties considering the relevant evidence (e.g., the relative strength and value of Microsoft's patents and the use of Microsoft's patents by Microsoft)." Motorola hopes that its 2.25% royalty demand appears more reasonable in the H.264 context by suggesting that Microsoft's H.264 patents have the same value. For IEEE 802.11 (WiFi, or WLAN), Motorola suggests that Microsoft is entitled to a fraction of that percentage. What appears to be a quid pro quo with respect to H.264 is, at a closer look, as nonsensical as it is asymmetrical. It makes no sense because Microsoft's position -- and not only Microsoft's but also that of many other major industry players -- on the appropriate H.264 royalty rate is already expressed by its participation in the MPEG LA AVC/H.264 pool. A license to the entire pool would cost a small fraction of what Motorola now sort of "offers" to pay for Microsoft's share of the pool. But even if we forget about that context for a moment, it's an asymmetrical proposal since Microsoft's revenues with H.264-compatible products dwarf Motorola Mobility's related sales. Also, the question of apportionment (under the Entire Market Value Rule) is not resolved by simply saying that Microsoft can also collect a percentage of the end product price. "4. Based on the royalty rates discussed above for the parties' H.264 portfolios and each party's relative exposure, Microsoft would owe royalties as set forth in Motorola Proposed Finding of Fact 472(h). However, the parties would have agreed to a reasonable cap as set forth in Motorola Proposed Finding of Fact 472(i). Depending on the structure for payment, a running royalty for Windows would be as set forth in Motorola Proposed Finding of Fact 472(j)." Motorola's suggestion that "a reasonable cap" would have been part of a negotiated license deal does not have any support in Motorola's October 2010 demand letters -- but Motorola will presumably argue that its original letters were more reasonable than they appear at first sight if one considers that negotiation might have changed something. However, two years ago Motorola gave a pretty clear ultimatum to Microsoft, and it asked for a percentage without any indication of the possibility of a royalty cap. Having followed this dispute for a couple of years, I must say that I was very surprised to find a reference to a "royalty cap". Not only is it new but it also seemed counterintuitive to me. I'm not aware of any case law that requires a royalty cap. If someone wants to maximize his FRAND royalty income, he would usually just argue that if a percentage is FRAND, it should be applied to all product sales. But as I said before, Motorola is seeking to justify its 2010 demand letters. If it weren't for that reason, I doubt very much that it would ever have argued that its royalties should be capped. The proposed royalty cap for Windows is stated in one of the redacted passages of the joint proposed pretrial order. It won't be a small amount, I'm sure. And even with the royalty cap, Motorola would still try to inflate H.264 (and IEEE 802.11) royalties in order to leverage the asymmetry between the two companies' revenues. To the general public, the upcoming November FRAND trials in Wisconsin and Washington State will be much less exciting than infringement trials such as Apple v. Samsung. But they will raise some interesting questions such as that of a FRAND royalty cap and will likely result in landmark decisions, unless Google (Motorola) elects to solve the scheduling conflict between the two trials by settling the FRAND parts of these disputes next week. There's no particular reason to assume that it will happen. But it's always a possibility, in any dispute, that the parties' lawyers show up on the first trial day and announce a settlement. Pursuant to Commission Rule 210.21(a)(1), Complainants Motorola Mobility LLC and General Instrument Corporation (collectively "Motorola") respectfully request termination of the subject Investigation in part with respect to U.S. Patents No. 5,319,712 and No. 5,357,571 (collectively "the 802.11 Patents"). 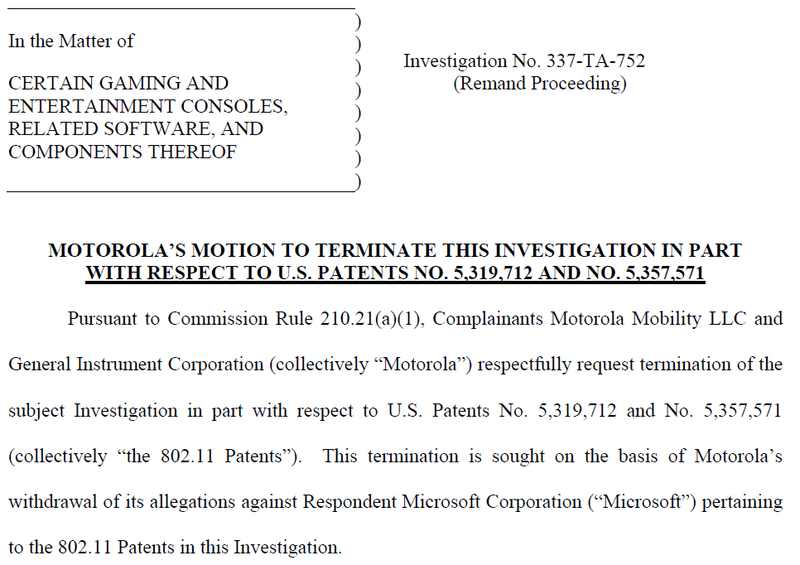 This termination is sought on the basis of Motorola's withdrawal of its allegations against Respondent Microsoft Corporation ("Microsoft") pertaining to the 802.11 Patents in this Investigation. In late June, the ITC's top-level decision-makers remanded this investigation, which was instituted based on a complaint Motorola brought in November 2010, to an Administrative Law Judge. The remand notice provided certain instructions that suggested that Google was rather unlikely to get leverage out of this investigation. One of the issues relates to method claims -- I just mentioned that topic yesterday in connection with Microsoft's appeal of its own ITC case against Motorola. The asserted claims from the two IEEE 802.11 (WiFi, or WLAN) patents that Motorola has just withdrawn were method claims. One of the H.264 patents remaining in the investigation faces the same issue. Microsoft says it's entitled to a reciprocal H.264 patent license from Motorola Mobility's parent company due to an MPEG LA-Google license agreement. That contract issue could, all by itself, take care of the remaining two patents in the investigation. The target date for the remanded investigation is July 23, 2012. A hearing will take place on December 5 and 6, and a remand initial determination (a preliminary ruling by a judge) is scheduled for March 22, 2013. Motorola's partial withdrawal reduces the risk of further delay. In fact, if a Microsoft motion for summary judgment concerning Google's grant-back obligation vis-à-vis all MPEG LA AVC/H.264 patent pool contributors succeeds, the case will just go away, possibly even prior to the upcoming evidentiary hearing. Earlier this month, Google's Motorola Mobility withdrew its entire second ITC complaint against Apple. Just like in the Microsoft case, the motion clarified that no agreement existed between the parties. That particular termination has meanwhile been approved by an Administrative Law Judge and the Commission, the six-member decision-making body at the top of the ITC. This week's motion in the Xbox case will likely also be approved in the short term. Next month, a Microsoft contract lawsuit to hold Motorola Mobility to its FRAND licensing promise will take place in Seattle. The parties filed a joint proposal for a pretrial order, in which they laid out their positions on that case (they unsurprisingly disagree on key issues). Previous ITC decisions either cleared Android devices of violation of the asserted patents (Apple's three-patent complaint against Motorola) or identified a violation with respect to only one or two patents at a time. But on Wednesday, Administrative Law Judge Thomas B. Pender issued a preliminary ruling in Apple's favor against Samsung over four patents: one design patent, one hardware patent, and two multitouch software patents. In its original complaint filed in July 2011, Apple had asserted five utility (technical) patents and two design patents. The case was streamlined in March through the withdrawal of one patent (and 15 claims of two other patents). Judge Pender's preliminary ruling does not find a violation with respect to two of the six remaining patents. The total number of valid Apple and Microsoft patents that Android-based devices have been held by courts around the world and the ITC to infringe has now increased to 20. Twenty. Such findings were made with respect to 16 other patents prior to Judge Pender's initial determination, while the Android camp is much less successful with its counterclaims, especially because it's enforcing injunctive relief over only one patent (in Germany). U.S. Design Patent D618,678 on an "ornamental design of an electronic device"
U.S. Patent No. RE41,922 on a "method and apparatus for providing translucent images on a computer display"
U.S. Patent No. 7,912,501 on an "audio I/O headset plug and plug detection circuitry"
The above findings don't surprise me. Back in March I analyzed Judge Pender's claim construction decision and saw Apple basically on the winning track with respect to these patents. Judge Pender's holdings are now subject to a Commission review, which Samsung will surely request. The Commission is the six-member decision-making body at the top of the ITC and usually hands down a final ruling four months after the initial determination. It has previously overruled its ALJs in many cases, and sometimes to a large extent. Even Apple has experienced this before: in the summer of 2011 it won a preliminary ruling (from a different ALJ) against HTC over two patents, but ultimately only the less powerful one of the two was deemed violated. 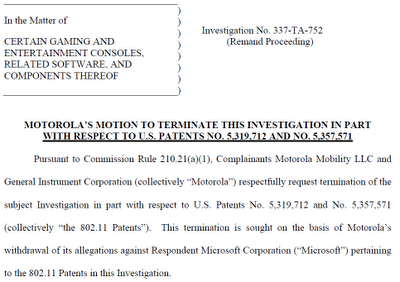 The Commission has recently remanded the investigations of Motorola Mobility's complaints against Apple and Microsoft. The key issue as always are workarounds and designarounds. Import bans or injunctions don't apply to products that don't actually infringe the relevant intellectual property rights. According to Judge Pender's initial determination (and a headline of a request for briefing that I discovered and blogged about in early September), Samsung has presented to the ITC modified versions of its products that work around the three utility patents found infringed. Details on those workarounds are not available yet, raising the question of whether they merely steer clear of infringement through substantial degradations of the user experience (in a worst-case scenario the removal of features) or preserve most of the user benefits of the claimed inventions while being on the legally safe side. More information will be available when the public redacted version of Judge Pender's initial determination is published, which will presumably take a couple of weeks (at least). By presenting designaround products to the ITC during the original investigation, Samsung sought to eliminate or at least reduce the potential for enforcement disputes (such as the one in which Apple says HTC's current U.S. products still infringe on a patent in violation of an import ban ordered last December). If Samsung implements any designarounds cleared by the ITC, it's on the safe side and its products won't be seized at customs. If it ultimately implements designarounds that are not identical to the ones presented to the ITC, there can still be a dispute, but the fact that a designaround was cleared may increase the likelihood of clearance of future designarounds. The initial determination doesn't mention a designaround for the D'678 patent, but design patent infringement can always be avoided. This preliminary ruling provides further validation to Apple's long-standing claims that Android-based devices infringe its intellectual property, but it's too early to tell whether the U.S. import ban that Apple may win on this basis is going to constitute a tipping point in the dispute. As soon as more details surface on Samsung's designarounds (hopefully those won't be redacted too ehavily), I'll analyze them just like I discussed the workarounds Samsung claims to have developed for the three multitouch software patents a California jury found infringed two months ago. The Rechtbank 's-Gravenhage, a court of first instance based in The Hague, Netherlands, today handed down its decision (in Dutch) on an Apple infringement claim against Samsung based on EP2098948 on a "touch event model". The Dutch court now reaffirmed in a full-blown main proceeding the finding of non-infringement of EP'948 that it made in a fast-track proceeding in August 2011, when it granted Apple a preliminary injunction against Samsung over a photo gallery page-flipping patent but did not hold Samsung liable for infringement of EP'948 (and Apple's tablet design right). This non-win was expected. The Dutch court was the first European court to throw out this patent (which would have quite some impact if Apple's interpretation of its scope ever was adopted), and in between the preliminary injunction denial and today's final (though appealable) ruling, Apple was unable to prevail on this patent against Samsung and Motorola in Mannheim, Germany, and against HTC (in a declaratory judgment action initiated by the Taiwanese handset maker) in London. Only the UK court declared the patent invalid. The Dutch and German rulings did not reach that question. In Germany, courts dismiss a case if they don't identify any infringement, and if they have serious doubt about the validity of an infringed patent, they merely stay a case, with (in)validity being determined in a separate nullity action. In the Dutch case, Samsung brought an invalidity counterclaim but only for the event of an infringement finding, which rendered it moot. Even though the court didn't have to adjudge Samsung's validity counterclaim, Apple has to bear the costs. The legal fees related to this proceeding that Apple owes Samsung amount to approximately $400,000. In Mannheim, Samsung's first non-infringement argument (for details on Samsung's defenses see my reports on the two Mannheim trials; 1, 2) carried the day. Today's Dutch ruling is based on Samsung's second non-infringement argument, which had considerably less traction in Germany than the first one but was successful in the UK. I can't rule out that the second non-infringement argument would also have succeeded in Germany if the case had hinged on it. The validity of this patent is under attack at the European Patent Office (EPO). Third parties can oppose the grant of an EPO patent within nine months. Thereafter, a patent can only be challenged on a country-by-country basis in national courts. This patent was granted in February 2011. Samsung filed its opposition in November 2011, just about in time to be admissible. HTC and now-Google-subsidiary Motorola Mobility joined the opposition proceeding later as intervenors. The three Android companies made their most recent filing in late June (apparently a reply brief to an Apple pleading). Against Microsoft's objections, wholly-owned Google subsidiary Motorola Mobility will be allowed to defend its well-known 2.25% royalty demand at a FRAND rate-setting trial in the Western District of Washington starting November 13, but the federal judge presiding over this litigation, Judge James L. Robart, has already declared himself "skeptical of Motorola's position" that it can base its royalty demand on the selling price of the relevant end products rather than the portion of this market value that is attributable to the relevant standards, IEEE 802.11 (WiFi, or WLAN) and H.264 (video codec). The order, which denies both parties' Daubert motions seeking to exclude each other's FRAND royalty reports, was entered yesterday and entered the public electronic record today. The expert reports themselves are sealed, and only versions of the Daubert pleadings are available. On September 8 I blogged about the Daubert motions and the responsive briefs. Three days later I commented on the parties' reply briefs. While not directly related to the Daubert motions, a Ninth Circuit ruling that came down later that month in Microsoft's favor is also worth mentioning. I have no idea how Judge Robart is going to adjudicate the parties' Daubert motions and other motions in limine. Since the November 13 trial will be a bench trial, he doesn't have to worry about juror confusion. If there's something he doesn't buy, he can throw it out now or he can let a party present such an argument anyway even if it's unlikely to succeed. The EMVR [Entire Market Value Rule] issue is a key one that could be addressed ahead of the trial, and it appears ripe for a decision. Judge Robart's approach to the Daubert order was clearly the permissive one: he didn't want to exclude testimony at this stage if any criticism, no matter how well-founded, goes to the weight and credibility of the testimony (which is a matter of, among other things, cross-examination at trial) as opposed to its admissibility. As a result, the bar was very high -- too high for the parties' Daubert motions. Motorola will have to respond at trial to Microsoft's FRAND royalty theory based on the idea of multilateral ex ante (pre-standardization) negotiations. Judge Robart notes that the ex ante approach to standards patent royalty negotiations "has been endorsed by numerous publications and the Federal Trade Commission". Judge Robart does agree that hold-up and royalty-stacking are valid concerns and that "Microsoft's proposed framework reasonably relies upon and logically addresses widely acknowledged and published concerns of hold-up and stacking found in licensing standard essential patents". Also, "[t]he fact that multilateral license agreements for standard essential patents, including the H.264 patents, do indeed occur in practice adds to the reliability of Microsoft's proposed framework". Nevertheless, the order acknowledges that there may be some difference between an ex ante negotiation and "Motorola's ex post promise that it license its standard essential patents on [F]RAND terms". But there's no reason why Microsoft couldn't present its theories. Microsoft objected to Motorola's report on three grounds. It argued that Motorola's testimony is unreliable because it starts with the usual 2.25% royalty demand it previously made in connection with cellular standards, which are something else than IEEE 802.11 and H.264. Microsoft also alleges Motorola's expert's failure to properly account for he value of Motorola's patents essential to those standards. The order doesn't say that Microsoft's criticism is necessarily wrong, but Judge Robart declined to hold Motorola's testimony inadmissible. A third Microsoft argument, however, almost succeeded. Microsoft argued that the Entire Market Value Rule (EMVR), a theory commonly used in connection with patent damages, requires the apportionment that Motorola refused to do by basing its royalty demands on the price of the relevant end product. The order recalls that "the court has already expressed skepticism that an appropriate [F]RAND royalty rate for Motorola's standard essential patents should be based on the end product price of Microsoft's products" and agrees with Microsoft that "Motorola's standard essential patents only relate to the 802.11 and H.264 capabilities, which in turn only constitute a portion of Microsoft's end products". It even goes as far as to say that "[i]t would thus seem illogical to turn around and base a [F]RAND royalty on the end product price". But the outcome-determinative consideration in this regard was that Microsoft sought exclusion of this testimony for violation of the EMVR, and Judge Robart's understanding of the EMVR is that a royalty rate can be based on the end product even without a showing that the patented features create the basis for customer demand. Judge Robart particularly relies on the Federal Circuit's Lucent Technologies, Inc. v. Gateway, Inc. opinion, in which this appeals court found that "the base used in a running royalty calculation can always be the value of the entire commercial embodiment, as long as the magnitude of the rate is within an acceptable range (as determined by the evidence)". Since Microsoft argued that use of the wrong royalty base is, in and of itself, a violation of the EMVR, Judge Robart denied its Daubert motion despite the skepticism I mentioned before. The EMVR has previously been criticized as not being hard and fast enough to prevent overcompensation of patent holders, and this Daubert decision suggests to me that there really is a need for stricter rules at least in connection with standard-essential patents. The idea of the royalty base and the royalty rate just being two variables and that a combination of them can be acceptable no matter what the royalty base is doesn't convince me. I think this applies only to negotiations in which parties can agree on a rate without a legal dispute. But once there's a controversy, there's a need for clear-cut rules that make the determination of an appropriate royalty rate reasonably likely. Considering royalty base and royalty rate just two variables that can be combined in all sorts of ways is a recipe for confusion. By expressing skepticism of Motorola's position, Judge Robart has made clear that there's a problem. If I were Google (Motorola), I wouldn't be thrilled by the prospect of going into a trial with a theory that the presiding judge, who in this case will decide without a jury (it's a bench trial), views skeptically. But there will be other FRAND cases in the future, and some of them will involve juries. If companies are allowed to argue at a trial that a seemingly low percentage of a grossly-inflated royalty base is acceptable, some juries may buy it. There's actually a high risk that many juries will set excessive royalty rates on that basis. In this Seattle action, the rate-setting exercise itself won't involve a jury. But again, the question is what framework should be applied in the future. What if someone starts suing Boeing over WiFi patents and seeks an allegedly modest percentage? Wouldn't it be preferable then to limit the royalty discussion to the WiFi component of the airplane as opposed to discussing percentages? Judge Robart has already made very important contributions to FRAND case law. I think there's a very good chance, especially in light of the skepticism he expressed, that his FRAND rate-setting order after the bench trial is also going to help provide clarity, and if it is upheld by an appeals court just like his antisuit (or, more precisely, anti-enforcement) injunction was affirmed, then it may be much harder for future litigants to ignore the EMVR, in the FRAND rate-setting context, in the way Motorola proposes to. I have no doubt that Apple's representation is accurate because Apple would otherwise risk major problems with the ITC and the DoJ. Also, this is consistent with (but more definitive than) what an unidentified source told Bloomberg in June. According to that June 30 report, "U.S. antitrust regulators have agreed the FTC will focus on Motorola Mobility and the Justice Department will scrutinize Samsung Electronics Co.'s handling of industry-standard patent claims". The source couldn't tell Bloomberg if any information demands have been issued. Apple's filing with the ITC suggests that this has meanwhile occurred. Most likely, the DoJ investigation is at a preliminary stage now but could result in the launch of full-blown investigation anytime. As Apple notes, the European Commission already started a formal investigation of Samsung's use of SEPs in late January (followed by the launch of two similar investigations of now-Google-subsidiary Motorola Mobility's conduct in April). On Friday, one of Samsung's German counsel expressed doubts in open court over the speed and resolve of the EU's top competition enforcer. In early September it became known that South Korea's Fair Trade Commission is also investigating Samsung's use of SEPs. On Friday (October 19), the Wall Street Journal reported, citing an unidentified source, that Google is contemplating a settlement with the U.S. Federal Trade Commission with respect to its wholly-owned subsidiary Motorola Mobility's pursuit of injunctive relief based on SEPs. U.S. and EU antitrust authorities, Korea's Fair Trade Commission and competition regulators from other parts of the world also participated in a patent roundtable hosted two weeks ago by the International Telecommunication Union (ITU), a United Nations agency. Apple told the ITC about the DoJ investigation as part of its defense against Samsung's request for a U.S. import ban against Apple's core products. Samsung filed the related ITC complaint in June 2011. In September 2012, an Administrative Law Judge made an initial determination clearing Apple of violation of any of Samsung's four remaining patents-in-suit. Meanwhile, Samsung and the Office of Unfair Import Investigations (OUII, frequently referred to as "the ITC staff") filed petitions for a review of this preliminary ruling by the six-member Commission, the top decision-making body at the ITC. In my analysis of the detailed version of the initial determination I concluded that an allegedly UMTS-essential patent, "U.S. Patent No. 7,706,348 on an "apparatus and method for encoding/decoding transport format combination indicator in CDMA mobile communication system", looked like "Samsung's best shot at the review stage". Apple can't rely on the initial determination being the last word (though that may be the case). If there's a review and if Samsung prevails on one or both of its SEPs-in-suit, there's a high risk of a U.S. import ban, which is the only remedy the ITC can order. There is profound concern over the possibility of ITC import bans based on FRAND-pledged SEPs among regulators and major industry players, and even on Capitol Hill. Apple's filing also recalls two congressional hearings on this issue and public interest statements filed in the meanwhile-remanded investigations of Motorola's separate complaints against Apple and Microsoft. Samsung also filed a public interest statement yesterday. Basically, Samsung argues that implementing a FRAND standard without a license to all patents is an infringement, and importing such products into the U.S. market constitutes an act of unfair competition that the ITC should stop. Samsung argues that it made a FRAND offer (claiming that its 2.4% royalty demand is appropriate) and that Apple's products should be banned since it doesn't pay. At first sight, 2.4% may look like a small amount, but if one extrapolates the figure based on Samsung's share of UMTS-essential patents, it becomes clear that no one could make any money selling wireless devices if every SEP holder made similar demands. Samsung's position that Apple should face an import ban unless it meets the 2.4% demand validates what University of Iowa College of Law Professor Herbert J. Hovenkamp wrote in the abstract of a paper he filed earlier this month: "Permitting the owner of a FRAND-encumbered patent to have an injunction against someone willing to pay FRAND royalties is tantamount to making the patent holder the dictator of the royalties, which once again is the same thing as no FRAND commitment at all."